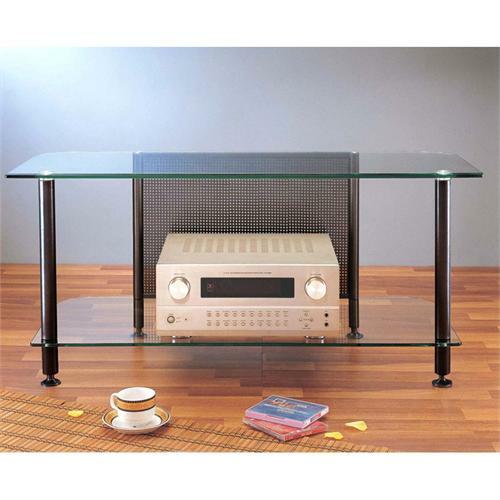 More on the VTI AGR Series 44 inch Glass Audio Video Rack TV Stand (Black) AGR44B below. Call a VTI AV rack specialist at 1-800-807-1477. Gorgeous looking TV/AV stand with beveled temper glass shelf. Perfect for mid- and small-size DLP, Plasma, and LCD TV sets. Adjustable leveling feet for balance and flooring needs. Caster and wire management system accommodations. Spacing between shelves: 15 1/4". Top shelf: 44" (W) x 18" (D); Supports up to 180 lbs..
Bottom shelf: 40" (W) x 17 3/8" (D); Supports up to 120 lbs.